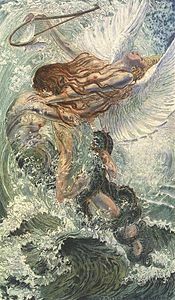 Carlos Schwabe (July 21, 1866 – 22 January 1926) was a Swiss Symbolist painter and printmaker. Schwabe was born in Altona, Holstein, and moved to Geneva, Switzerland at an early age, where he received the Swiss nationality. After studying art in Geneva, he relocated to Paris as a young man, where he worked as a wallpaper designer, and he became acquainted with Symbolist artists, musicians (Guillaume Lekeu, Vincent d'Indy) an writers. In 1892, he was one of the painters of the famous Salon de la Rose + Croix organized by Joséphin Péladan at the Galerie Durand-Ruel. His poster for the first Salon is an important symbolic work of the idealist new art. He exhibited at the Société nationale des Beaux-Arts, at the Salon d'automne and was present at the Exposition Universelle of 1900 (Gold Medal), but also in Munich, Zürich, Vienna, and Brussels. His paintings typically featured mythological and allegorical themes with a very personal and idealist vision and a social interest. His important work La Vague (The Wave), and its preparatory drawings are a testimony of the engagement of the artist during the "Affaire dreyfus". Schwabe is one of the most important symbolist book illustrators. He illustrated the novel Le rêve (1892) by Émile Zola, Charles Baudelaire's Les Fleurs du mal (1900), Maurice Maeterlinck's Pelléas et Mélisande (1892), and Albert Samain's Jardin de l'infante (1908), but also texts by Haraucourt, Mallarmé, Blondel, Mendès, Lamennais etc. The most important works by Schwabe belongs to the Musée d'Orsay in Paris, the Musée d'Art et d'Histoire in Geneva, the Museu Nacional de Belas Artes in Rio de Janeiro, the Van Gogh Museum in Amsterdam, the Royal Museums of Fine Arts of Belgium in Brussels and in private collections. Schwabe received the French Légion of Honor in 1902. 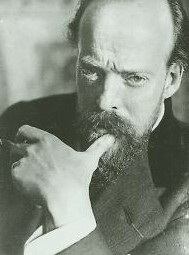 Schwabe lived in France for the rest of his life and died in Avon, Seine-et-Marne in 1926. Two distinct styles are recognized in Schwabe's art. Before 1900, Schwabe's paintings were more individual and experimental, indicating the idealism of the Symbolists; conventional, allegorical scenes from nature became more prominent in his later work. Images of women were important, sometimes representing death and suffering, other times creativity and guidance. His first wife was his model for angels and virgins, and "Death" in Death and the Grave Digger (1895) resembles her. The death of a close friend in 1894, the musician Guillaume Lekeu, when Schwabe was 28 years old, engendered his interest in representing death and the world of ideal creation. Schwabe created an important watercolor that was the model of a lithographic poster for the 1892 Salon de la Rose + Croix, the first of six exhibitions organized by Joséphin Péladan that demonstrated the Rosicrucian tendencies of French Symbolism. Schwabe's poster depicted in shades of blue an initiation rite—three women ascending toward spiritual salvation—and is an exemplar of Rosicrucian art. Jumeau-Lafond, Jean-David, (1986), Une autre lumière. 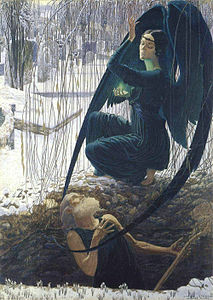 Carlos Schwabe, l'idéalisme et la mort in L'Écrit-voir,n° 8. Jumeau-Lafond, Jean-David, (1986), Carlos Schwabe, illustrateur symboliste, Bulletin du bibliophile, n° 2. 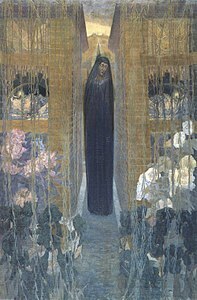 Jumeau-Lafond, Jean-David, (1987), Carlos Schwabe et le nouveau mysticisme", in Un symboliste genevois : Carlos Schwabe, exh. cat., Genève, musée d'Art et d'Histoire. Jumeau-Lafond, Jean-David, (1987), Carlos Schwabe, illustrateur symboliste du Rêve de Zola, Revue du Louvre et des musées de France, n° 5-6. Jumeau-Lafond, Jean-David (1988),Guillaume Lekeu et Carlos Schwabe : "Une haute confraternité artistique"", Revue de musicologie, t. 74, n°1, 1988, p.53-68. 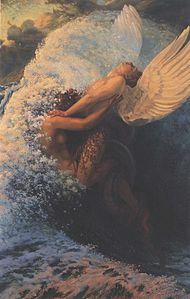 Jumeau-Lafond, Jean-David (1993) Révolte et folie visionnaire chez Carlos Schwabe : La Vague 1906-1907, in "L'Âme au corps", exh. cat., Paris. Jumeau-Lafond, Jean-David, (1994), Carlos Schwabe, symboliste et visionnaire, Paris, ACR editions. Jumeau-Lafond, Jean-David, (1996), Peinture, hystérie et opéra : les révoltées tragiques de Carlos Schwabe, Genava, revue du musée d'Art et d'Histoire de Genève. Jumeau-Lafond, Jean-David, (1999), Les Peintres de l'âme. Le symbolisme idéaliste en France", exh. cat. Bruxelles, Paris (and 2000-2004 : Salzburg, Chemnitz, Madrid, Japan : German, Spanish and Japanese translations). Clement, Russell T. et al. (2004). A Sourcebook of Gauguin's Symbolist Followers. Greenwood Publishing Group, 865–867. ISBN 0-313-31205-2. Jumeau-Lafond, Jean-David (2007), Painters of the soul, Tampere, Museum of Art. Greenspan, Taube G. "Schwabe, Carlos." In Grove Art Online. Oxford Art Online (accessed May 26, 2008). Jumeau-Lafond, Jean-David (2011) Séailles mécène : Schwabe, la conscience et l'exemple, introduction to : Gabriel Séailles, "Carlos Schwab" (1914, in Le Génie dans l'art, anthologie des écrits esthétiques et critiques de Gabriel Séailles, Sarah Lindford and Michela Passini, Paris, Kimé 2011. Jumeau-Lafond, Jean-David (2017) "Carlos Schwabe" in "Mystical Symbolism. The Salons de la Rose+Croix 1892-1897", exh. cat. ,New York, Solomon Guggenheim Museum. This page was last edited on 14 March 2019, at 10:20 (UTC).